There is a common misconception that etiquette is an antiquated art which belongs in the past and holds no relevance today. Blasphemy, I say! I would argue that the beauty of etiquette is its timeless and everlasting value because it is a method of life which promotes an interest in putting others at ease. According to the dictionary, etiquette is the "conventional requirements as to social behavior; proprieties of conduct as established in any class or community or for any occasion." Now, I won't say that the dictionary is wrong (I would never have the audacity to do such a thing), but I will suggest that this definition does not cover everything etiquette is. When you hear the word, perhaps you think of a prudish grandmother, scolding you for using the wrong fork during a meal. Or, perchance, a snobby elitist who uses societal rules to promote class distinction, comes to mind. Unfortunately, this is what has become of the name of etiquette, but let me tell you this is far from the origins of this art I am so passionate about. Now, I won't go into the history of etiquette and bore you with tales of Emily Post and Amy Vanderbilt (although, it still shocks me that people can find this boring, but I digress). What I will do is explain why I believe etiquette has, does have, and always will have a place in our society. The true essence of etiquette is the intention of putting others at ease. This quote of Emily Post sums up this sentiment perfectly: "Manners are a sensitive awareness of the feelings of others. If you have that awareness, you have good manners, no matter what fork you use." To act in accordance with etiquette is to behave in a way that takes into account the people you are with and are affecting. By putting others at the forefront of your mind you strive to be a pleasant person and to encourage the comfort those you interact with. Therefore, how could etiquette ever go out of style? It would be fair to say that we all crave a little structure and some rules and regulations, which is why etiquette strikes that perfect and enduring balance. It allows us enough leeway to make our own decisions while simultaneously providing us guidelines so we know how to act appropriately in any situation. This innate human desire for rules will always be relevant, hence we can rely on etiquette to guide us. Of course, I enjoy the rules and regulations surrounding the mode of behavior etiquette encourages (I'm all about knowing what fork to use), but when it comes down to it I am a fan of good manners (as described by Emily), good taste, and good values, and never bringing anyone down. What are your feelings on etiquette? 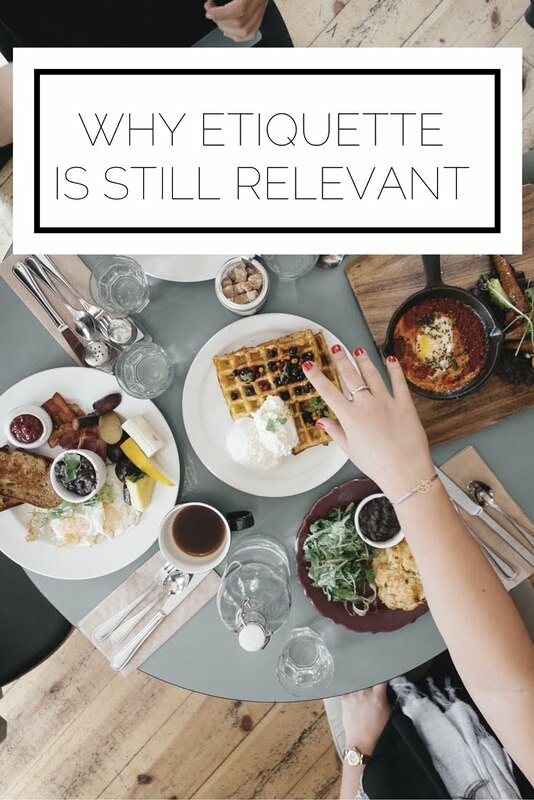 Check out all of my other posts on etiquette here.